The Faculty of Architecture, Design and Planing at The University of Sydney has recently installed a SmartSlab LED screen inside the window display facing the yard in front of the faculty building. SmartSlab has attracted quite some attention since it was introduced a few years ago by b consultants ltd, an architectural consultancy run by Tom Barker. It is specifically unique due to its resistant structure and modular approach: the screen is shipped in 600 x 600mm tiles that can be built up into large arrays of any size. The steel and polycarbonate structure allows it to be even used as flooring or curtain walls in buildings. Over the years TOAS Mikontalo has been residence for thousands of students from all over the world. ‘Mikkis’ is one of the best known (both liked and disliked) dormitories in Finland. With the currently ongoing renovation, Mikontalo will be reborn. However, before this, one thing had to be done… MIKONTALOLIGHTS. The object of MIKONTALOLIGHTS was to create the world’s physically largest colored graphics platform by using the windows of Mikontalo’s D-staircase as light pixels. The platform was used to play Tetris and other games and present demos created by the students of Tampere University of Technology. The project climax was on December the 4th when the new lights of Mikontalo were lit. The goal was to gain global visibility for Tampere University of Technology and the rich student culture of the Uni. The public event of MIKONTALOLIGHTS was a tremendous success. There were more than 2000 spectators at once and total count of interested spectators was close to 4000. Thanks to Damien Mair (Fusion) for sending me the link. This is my presentation at the Media Architecture Conference in London in Sept. 2007. with voice and better image quality. 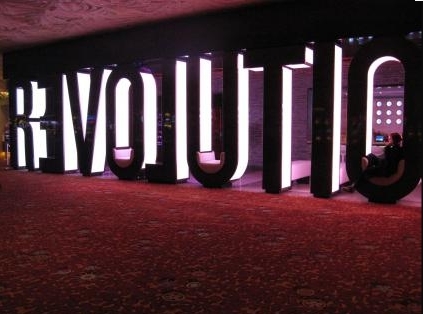 *”Revolution”* is a new bar in Las Vegas which was created as homage to the Beatles. Moment Factory was given the mandate to create to a mix-media installation combining video projections; LED screens and LED lighting fixtures. 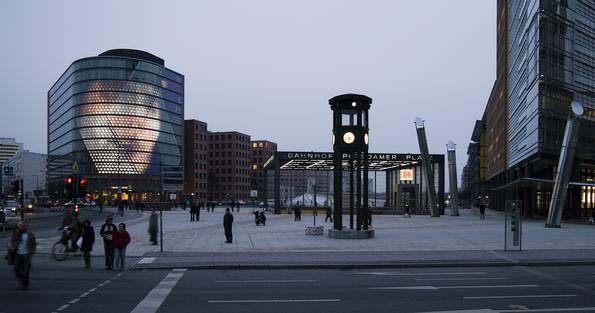 From today you can register your project for the Luminale 08 (6th to 11th April 2008). You find the registration form on the website http://www.luminapolis.com under the heading: TOP NEWS. Luminale is part of light+building. spectr|a|um offers a night with audiovisual performances and visual art on the 145 m high Dexia Tower, from which 4200 windows will be enlightened by internationally renowned musicians and artists, taking place on Place Rogier’s urban lounge and Dexia Tower. On behalf of the team of organisers I’d like to thank you for having spent two great days with us. It was mainly your contributions, questions and comments that made it a success. In the next days and week we want to provide more documentation material of the conference and of course we keep on posting projects and news in the field of Media Architecture. There have been a lot of new projects in the presentations but also during the coffee brakes, that are waiting for being referenced here. If you have the impression that a certain project is missing here please send me an e-mail: gt[at]realitylab.at or use the “Suggest a project” button. On 11th and 12th September Media Architecture 2007 will take place at Central Saint Martins Innovation in central London. Organised by Media Architecture Group in Vienna, the conference will bring together international speakers from the architecture, planning and media communities for the first time to address the increasing integration of new display technologies for building construction. The huge impact of this development for building design and the urban environment will be explored from both theoretical and practical implementation perspectives by leaders in the field. The conference takes place at the same and is co-organised with PLASA, the international lighting exhibition at Earls Court, London. More info can be found [here]. “SPOTS will be a gallery for a series of curated art projects for public space. Commissioned by ad agency Café Palermo Pubblicità for HVB Immobilien AG, the installation was designed by Realities:United, a Berlin-based architecture studio with previous experience in creating large-scale light installations. Their BIX facade for Kunsthaus Graz garnered much international attention, and won them more than a few awards.